One of the most significant issues facing Smart Cities is how to use OpenData and City Data, especially citizen contributed data, to facilitate new innovative city services. Pushing Opendata to city websites has certainly opened up data for access, but it’s still the case that most Open Data is hard to use – partly because of data formats and partly because of the lack of consistent access. These issues become even worse when you want to add in data from City infrastructure, or data contributed by end users. Our solution is to focus on the notion of a Smart City Datahub, a central location that gathers, manages and exposes data in a clean and consistent way. 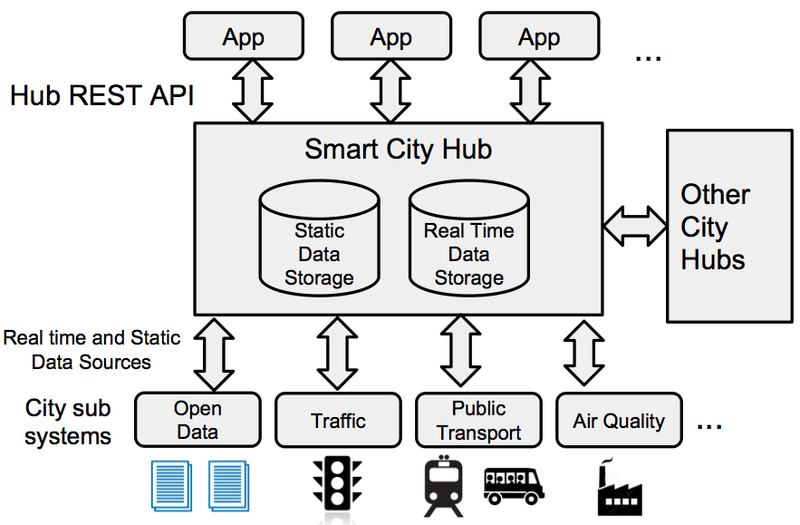 The Smart City Datahub is a cross between an IoT platform and an OpenData portal. The IoT side of the datahub manages real time data, for example transportation info which is often delivered by cities in real (or near) real time. The OpenData portal focuses on static data, or data that is delivered in data formats that slowly change such as 311 call data or city spending. We have been exploring the use of IoT hubs as the basis for Smart City projects as part of our research at UBC since early 2013. In collaboration with one of our partners, Sense Tecnic Systems Inc, a local IoT platform provider, our explorations have resulted in two significant deployments, one in the UK, focusing on road and highway infrastructure (Smart Streets) and the other in Canada (Urban Opus)focused more generally on Smart Cities. In early 2013, the UK’s Technology Strategy Board (TSB) invested in a project called the Internet of Things Ecosystem Demonstrator to stimulate the development of an open application and services ecosystem in the IoT. In this project, eight industry-led projects were funded to deliver IoT clusters in the spring of 2014. These projects all explored the use of an IoT hub to represent clusters of things from different aspects of smart cities and smart infrastructure. These clusters covered a range of areas including smart schools, urban transportation, airports, smart homes and critical infrastructure such as roads and highways. As developers of the Smart Streets IoT Hub, our focus was the Highways maintenance sector (a $6B sector in the UK), which gathered data from a variety of sources related to the UK’s national and regional road network. This effort was led by InTouch Ltd., a UK-based SME that provides data solutions for many companies that maintain the UK’s highways infrastructure. Partners included three large companies, Amey, Balfour Beatty, and Carillion, engineering companies that build and manage public infrastructure, Sense Tecnic Systems Inc. that provides IoT hubs, and the University of Lancaster as a research partner. Data included real-time traffic flows, incidents that affected traffic flows, road works, flood and rain data, all of which were made available via the Smart Streets Hub. 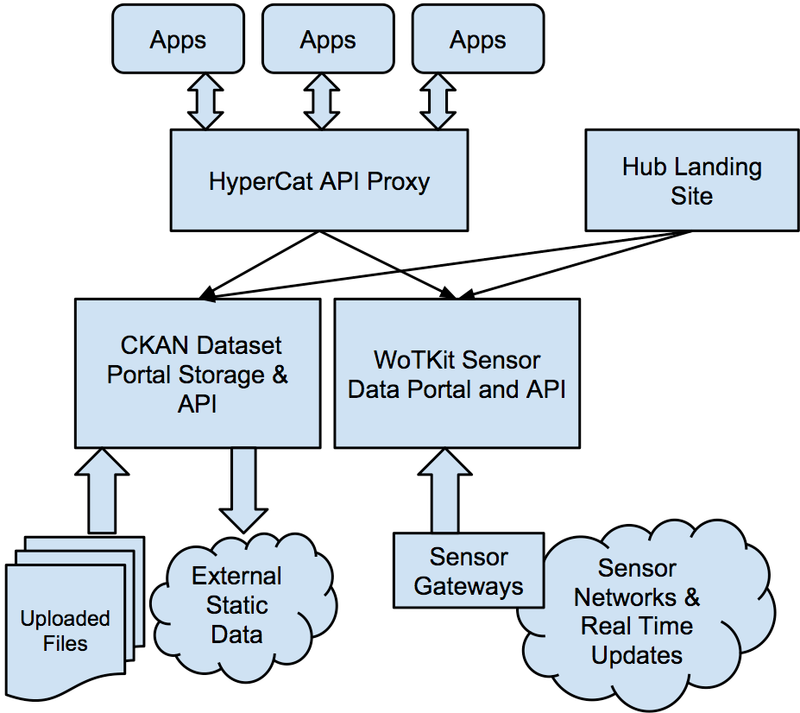 A particular focus of the programme was establishing interoperability between the 8 hubs, which resulted in the specification of a lightweight interoperability protocol for IoT hubs, known as HyperCat. Opus Hub provides data storage and federates existing data sources to provide a single on-line presence and point of access to these data sets. The system shares the same basic architecture as Smart Streets with support for both real time and static data, and an easy to use API for developers. 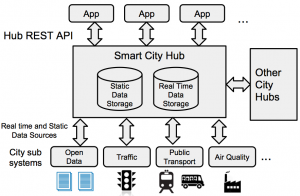 Both Smart City hubs have been deployed and used for a variety of applications. Of the two, the Smart Streets IoT hub has been operational for slightly longer, approximately 18 months, and currently manages over 64,000 time-series sensor feeds and a wide variety of static datasets. It includes a diverse set of both open and private data about transportation, road traffic, and highways, ranging from real time traffic data, to road asset condition, planned roadworks, air quality, weather and flooding information. 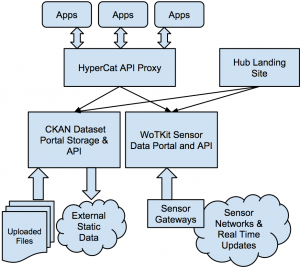 These data sources have been pushed into the hub either via tools such as the Harvestor, by end users uploading data sets, or from physical devices, explicitly sending information to the Hub via its APIs. At a recent hackathon, 50+ participants from Switzerland, Germany and the UK developed a series of apps, and over a two day period generated more than 300K Hub API calls transferring over 9 GB of data. In addition to these Hackathon apps, our group and others have built a variety of web and mobile IoT applications and experimented with both the abstractions and the Hub APIs. To make it easy to find and install hub applications, both systems include ‘app store’ functionality to list featured applications and provide a way of rating and searching for applications that make use of the hub as illustrated in Figure 4. Applications developed for the Smart Streets Hub have included a “Catalogue Explorer” to browse not only our hub catalogue, but that of the other seven hubs. Other roadworks-related applications include one to visualize correlations between drain blockage and road works called “Roadworks Gully Correlator”, a predictive application called “Pothole Predication” for pot hole analysis, and “Cycle Spot”, an app to allow cyclists to avoid road hazards, including roadworks, poor road conditions and winter issues such as ice. The Urban Opus hub includes several applications, e.g. 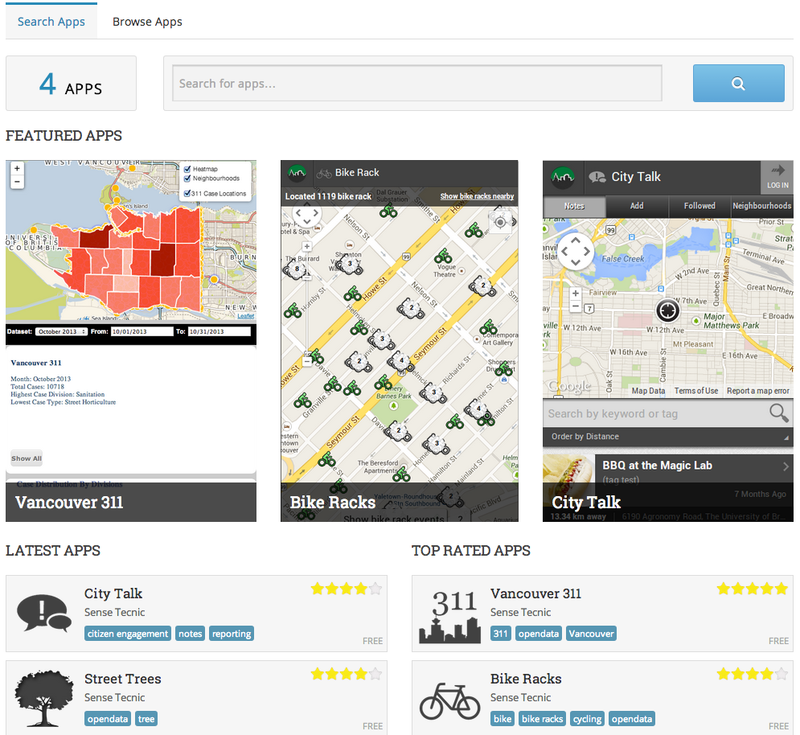 a 311 visualization application allowing citizens to explore data about citizen requests and complaints, ‘Bike Racks’ to find and report on the condition of bike parking in the city, and ‘Street Trees’ to access and contribute data to a database about Metro Vancouver’s urban forest. 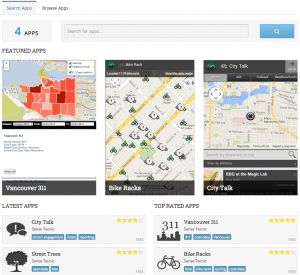 The Urban Opus project, focused more on citizen and citizen facing services has developed a number of different applications – these are available to explore in the app section of the hub (http://urbanopus.net/app-browse/). They include a ‘Bike Rack’ Application leverages the bike rack inventory of the city to display locations where cyclists can safely lock up their bikes. Users can report problems with these locations such as vandalism or full bike racks. The Hub logs interaction with the application, including where and when users search for bike racks. Using this data, our hope is that authorities in the region can prioritize investments in maintaining and purchasing more bike racks for cyclists.. A 311 data visualization app allows citizens to explore the 311 call data and gain a better understanding of what issue are prevelent and which issues crop up in which areas of the city. One of the key aspects of the hub based approach to Smart Cities is that by providing a single cloud based respource for Smart City data, we are essentially providing a building block for the smart city innovation ecosystem. As cities attempt to foster innovation, one of the key issues is providing innovative start-ups and non-profits with access to city data. The Smart City Data Hub offers a single point where potential service providers can explore data and visualize it through a web based UI. Once they find data that is of interest, it can be downloaded for use or, perhaps more importantly, it can be accessed using a common API. This allows new service providers to quickly develop service apps that use data freeing them from the issues of finding data, massaging and cleaning it, and ensuring it remains up-to-date. Further, by offering a simple app store, as both Urban Opus and Smart Streets do, we can provide a central location where citizens and other end users can find and try out new Smart City services.